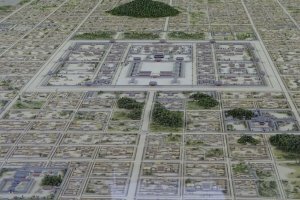 Imagine an ancient capital spread out over an area of over 20 square kilometres, guarded by three sacred mountains: this scene is the setting of Fujiwara-kyo, Japan’s first integrated capital city built 1,300 years ago. It is common knowledge that Nara and Kyoto were previous capitals of Japan and foreign visitors flock there in their millions to visit temples and other historic sites. 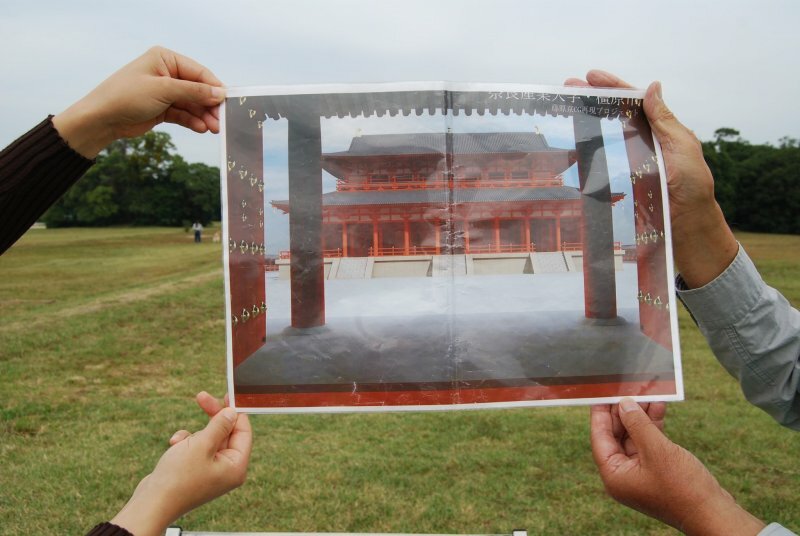 Nara’s Heijo-kyo was Japan’s capital from 710, and Kyoto’s Heian-kyo from 784. Both capitals were laid out in a grid following the model of ancient Chinese capitals. Did you know then that there was another capital before that, also carefully planned and executed in the layout of a grid? 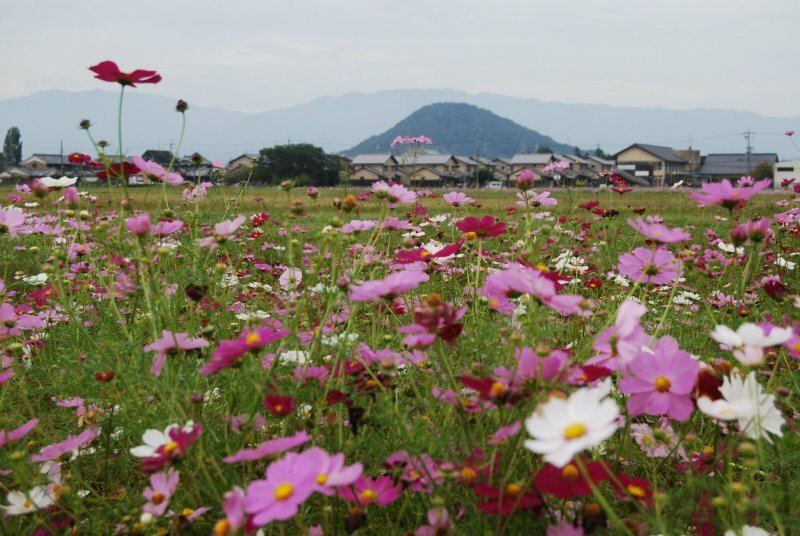 Welcome to Fujiwara, Japan’s first planned capital and seat of imperial rule for 16 years (694 and 710). The Japanese nation had just formed in the Yamato Plain, present-day Nara Prefecture. Early emperors and empresses who resided in Asuka, Japan’s capital before Fujiwara, tried to consolidate their power and influence. Emperor Tenmu (631-686) and, after his death, Empress Jito (645-703), who were actually a regal couple, succeeded in doing so. Tenmu issued civil and administrative codes that regulated the government and activities of the bureaucrats. Jito, after becoming Empress, further implemented these codes of law. They set up a centralised government in an integrated capital built to rule the new nation. Tenmu died after the start of the project but his wife saw the completion of this mammoth task to its end. The new governmental structure needed a proper setting to function well. Hence, the new capital had a proper State Hall, a State Assembly Hall and Government Offices. When Asuka was the capital, each new ruler would establish a new palace at a different location to avoid running into trouble with spirits of the past. This is why there are a great number of former palace sides in Asuka, an area that is also famous for tumuli, the imperial burial mounts. In short-lived Fujiwara only one grand palace was ever built which stood in the centre of the capital. 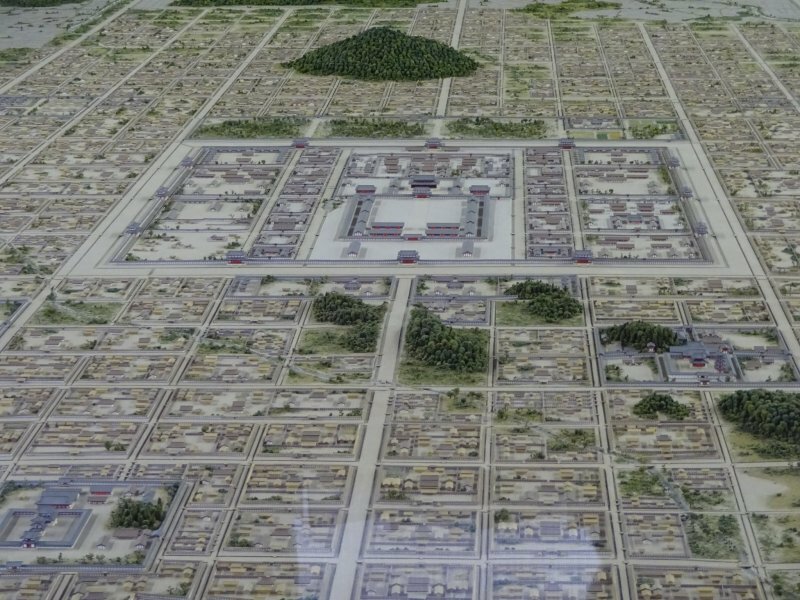 The palace covered an area of one square kilometre and was surrounded by large walls. On each side of the four walls there were three gate. 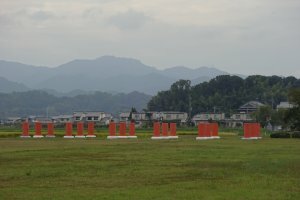 The most important gate was south-facing Suzakumon. 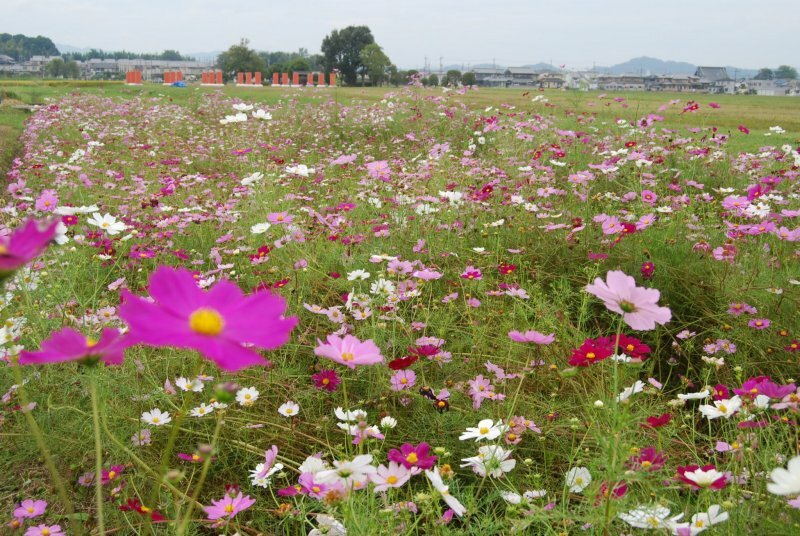 A 24 meters wide boulevard-like street, the Susaku Highway, ran North-South through the capital. At the centre of the palace compound stood the Imperial Audience Hall. This was the place where politics was made and where official rituals for the protection of the nation took place. Fujiwara Palace was actually the first imperial palace with a tiled roof. 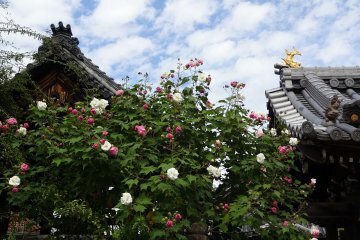 The clay tiles were produced in various parts of Japan and transported to Fujiwara together with large amounts of other building materials, such as timber. It is estimated that 2 million roof tiles were made for the palace. All other buildings in the capital had roofs made of wooden shingles or bark. It is known that the grid of roads was established first and later the buildings were added. Recently remains of a canal and ditches were unearthed, which are said to have been used for transporting materials. 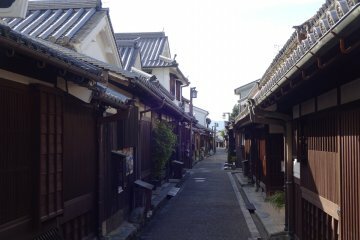 Almost nothing of the Fujiwara capital remains today. A fire broke out in 711 and burned down the whole city. 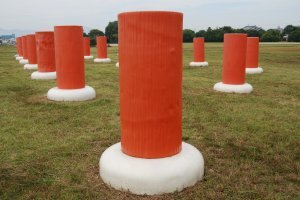 All that remains is the location, a wide open space, an earthen mound where the Imperial Audience Hall once stood, and some foundation stones now marked by large mock pillars. The arrangements of these vermillion-coloured pillars in the landscape gives you a vague idea of the vast dimension of the Fujiwara capital. 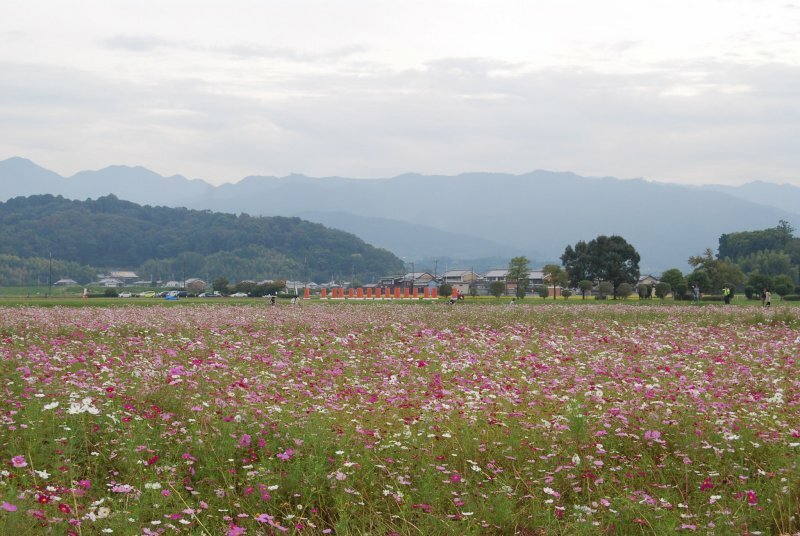 Standing in the middle of what is a meadow now, where once the busy streets of the capital were, you can see the Three Sacred Mountains of Yamato in the near distance: Unebiyama, Kaguyama and Miminashiyama. They were said to have been within the capital city’s parameters, although they seem quite far away to us now. Excavations are ongoing and to date they have unearthed a great number of mokkan, or wooden tablets that officials of the newly established government used to write on, as well as coins, identified as Wado Kaichin, Japan’s first official currency, minted at the Fujiwara capital! These items are on display at the Kashihara Archaeological Institute, the Nara National Research Institute and at the Fujiwara Capital Information Centre, the latter being located nearest to the site. 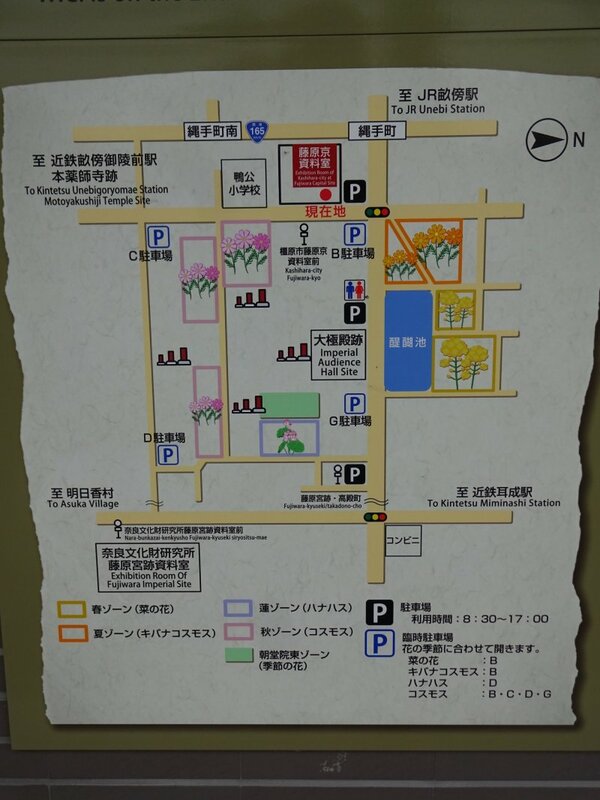 This Information Center is the best place to start your visit of the Fujiwara capital ruins. A 1:1000 scale display of the Fujiwara and Asuka area is worth checking out, as is watching a short cartoon set in Fujiwara. 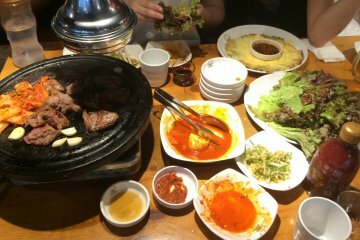 Once you got a grasp of the former glory of this place, you are ready to explore the site. 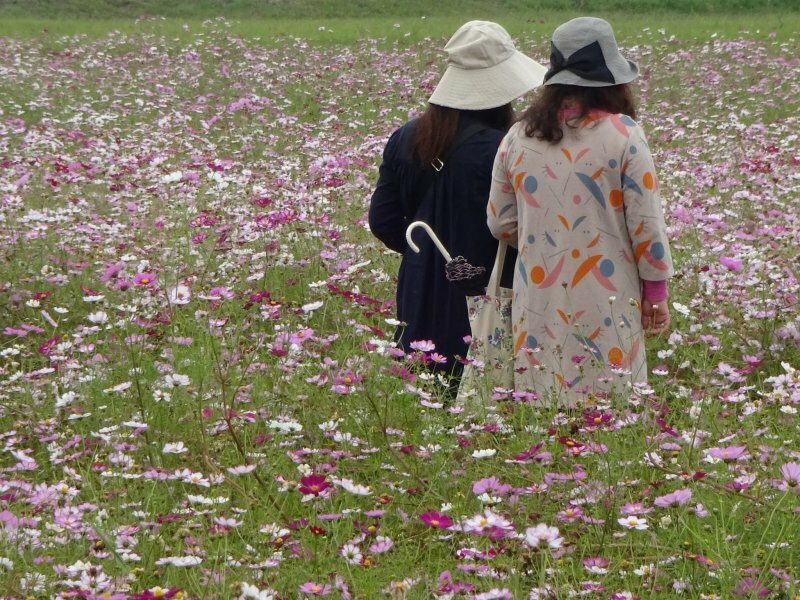 Rather than looking for ancient stones and artefacts, the majority of visitors today come here to enjoy the display of seasonal flowers. 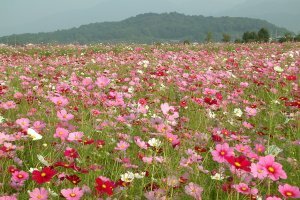 On the grounds of the former palace site there are large fields filled with rapeseed in spring, lotus in summer and cosmos in autumn. 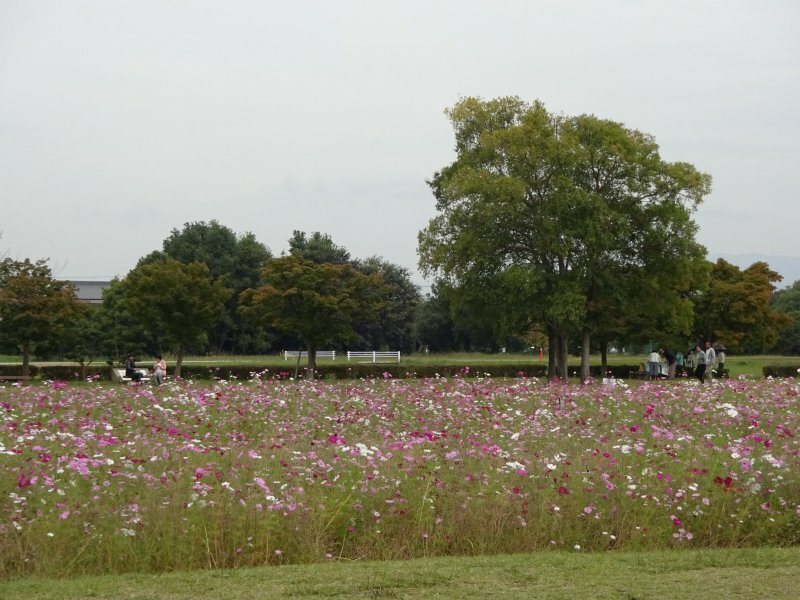 Around the site there are also many cherry trees and maple trees whose pink petals or colourful leaves can be enjoyed in spring and autumn respectively. 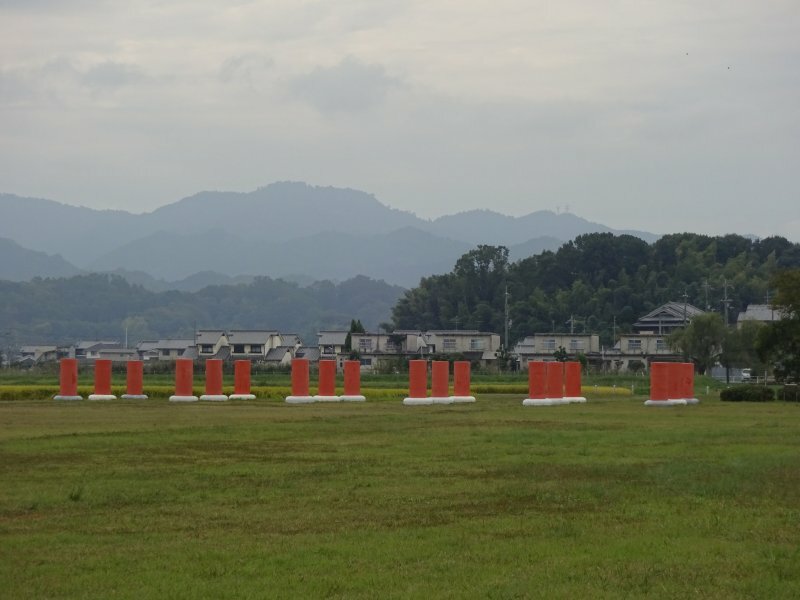 Why not rent a bicycle and explore this ancient site together with a cycling trip to nearby Kashihara Jingu Shrine, a must for history buffs of Japan’s ancient times! As the former palace site is very large, you have several options to approach it from different sides. 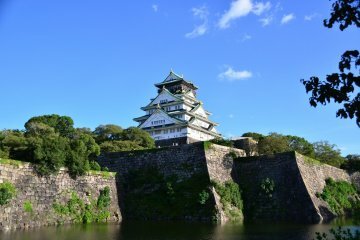 Access by Kintetsu Rail from Kintetsu Osaka Abenobashi or Kintetsu Kyoto: the site is a 30 minutes walk away from Kintetsu Miminashi Station and also 30 minutes from Kintetsu Unebogoryomae Station. Access by JR from JR Osaka or JR Kyoto: take the JR Sakurai Line and get off at JR Unebi Station. From there it is a 30 minutes walk. There is also good access by riding the Community Bus. 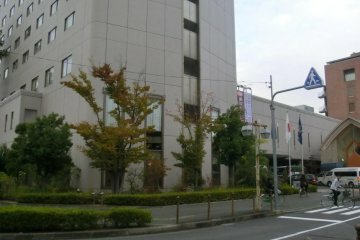 Catch the bus in front of Yamato-Yagi Station and get off at the Fujiwara Capital Information Center. The bus fare is yen 170. Even better, rent a bicycle from one of the rental stations at Kintetsu Kashihara Jingu or at Kintetsu Yamato-Yagi and cycle here. Celebrating my 10th year anniversary in Japan in May 2018, the country that I call home now. I lived in crazy Tokyo for 6 years and since 2011 I call the Kii Peninsula (Kumano, Koyasan and Yoshinoyama) my home. 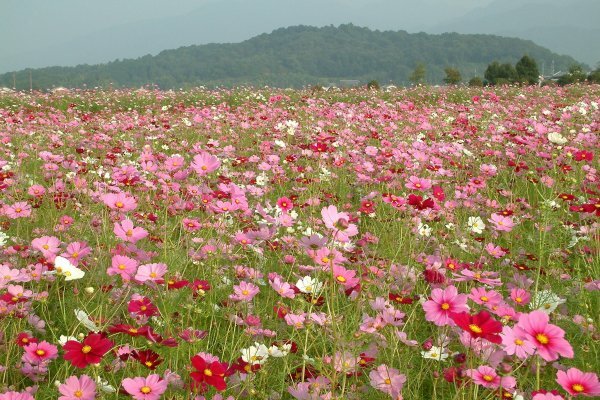 I have visited all 47 prefectures of Japan and for the last 4 years I have worked as a guide for foreign visitors. 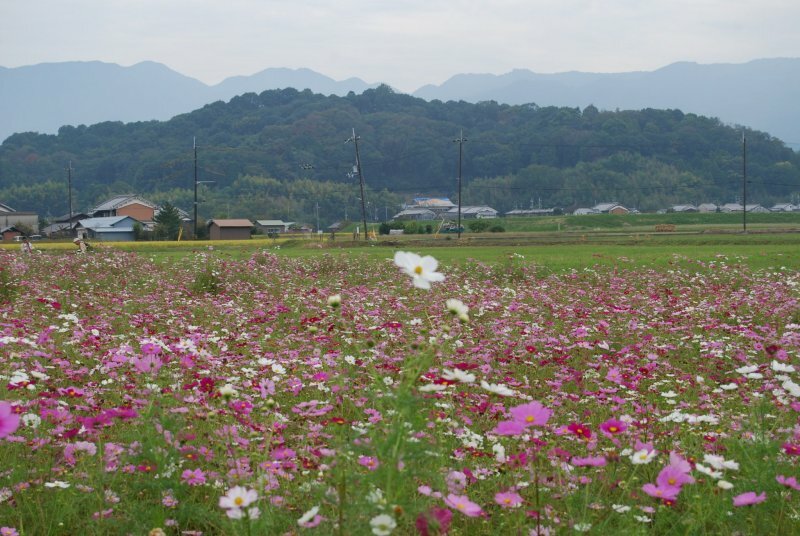 My special interest is in Japanese nature and spirituality. I love spending time in the forest and mountains and I love visiting temples and shrines. 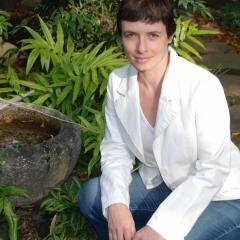 I am also a licensed guide for the Kumano Kodo pilgrimage trails and for Koyasan, the Buddhist monastery, in addition to being a practitioner and guide for Shinrin Yoku (Forest Therapy). In recent years I have taken visitors to walk the Kumano Kodo trails, the Nakasendo trail, the 88 temple pilgrimage trail around Shikoku Island and to Dewa Sanzan, the three sacred mountains in Yamagata Prefecture. 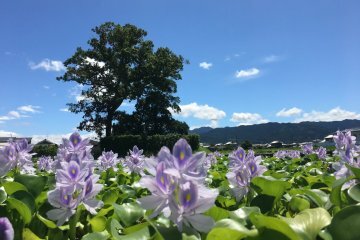 If you look for nature and spirituality in your trip to Japan, then Wakayama, Nara and Yamagata Prefectures are ideal places to get started! 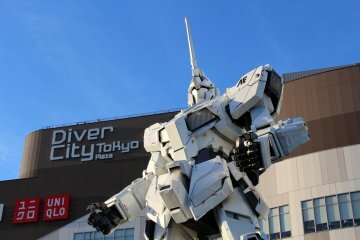 Tokyo's Korea Town: Top 10 Things..
Unicorn Gundam Statue in Odaiba.. 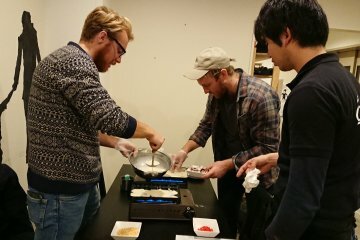 Thanks, this is a nice report on Japanese history. 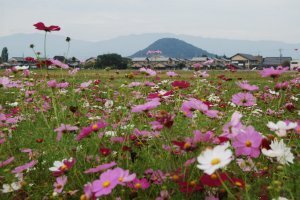 The photo of a field of cosmos - where once stood the palace of Fujiwara - is pretty cool! 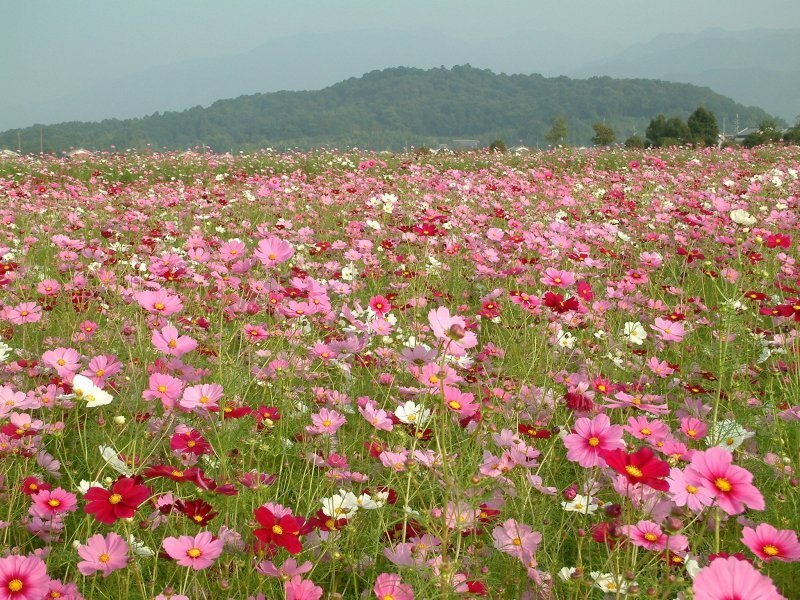 Love the views with the beautiful cosmos flowers!